Consiga um excelente preço em NH Ciudad de Cuenca - pontuação de 8,3 dada por hóspedes recentes. Very nice and well located hotel with great customer service and amazing buffet breakfast. The reception lady is great! Tell the tourist attractions and traffic information in great detail! It was a good size room, good internet connection, close walk to the centre of the city/town, nice and warm and 2 locations for parking. The room was comfortable and very clean. The safe was free to use and easy. The bed was comfortable with a choice of pillows. Free bottle of water and a mini bar. The bathroom had complimentary toiletries of a good quality. Breakfast was included and was very good indeed. Plenty of choice, hot and cold food. Great position in town to walk from. Great underground car park for a small fee. Would recommend for sightseeing. About half an hour walk to the Hanging Houses and old town. Fabulous. Classic business hotel - comfortable & well-appointed. A bit further from town than I'd expected, but some really good restaurants just next door & a lovely bakery & coffee shop opposite. Lots of free on-street parking. Friendly staff who gave us many useful suggestions about what to see and eat. Good breakfast and nice room with usual high NH standard. 10 minutes drive from old town. "quarto agradável, cama, lençóis, travesseiros, roupa de banho de ótima qualidade e confortaveis, banheiro limpo com ótima ducha. não fiz uso de restaurante e não tomei café da manhã"
"Fantastic room, big, clean, modern and super comfy"
"The city of cuenca Staff was friendly and understanding"
"Very nice and well located hotel with great customer service and amazing buffet breakfast." "The reception lady is great! Tell the tourist attractions and traffic information in great detail!" "- very supportive personnel - good location -sauna and fitness room"
"It was a good size room, good internet connection, close walk to the centre of the city/town, nice and warm and 2 locations for parking." "The room was comfortable and very clean. The safe was free to use and easy. The bed was comfortable with a choice of pillows. Free bottle of water and a mini bar. " "Classic business hotel - comfortable & well-appointed. A bit further from town than I'd expected, but some really good restaurants just next door & a lovely bakery & coffee shop..."
"Friendly staff who gave us many useful suggestions about what to see and eat. Good breakfast and nice room with usual high NH standard. 10 minutes drive from old town." Uma das opções mais escolhidas em Cuenca.Com um centro de fitness e uma sauna, o NH Ciudad de Cuenca está localizado em Cuenca. Disponibiliza quartos climatizados com acesso Wi-Fi gratuito. Há fácil acesso ao centro histórico de Cuenca, situado a 5 minutos de carro. Os quartos luminosos no NH Ciudad de Cuenca dispõem de pisos em parquet, de televisão por satélite e de um mini-bar. Existe aquecimento central e uma casa de banho privativa. O restaurante tradicional serve refeições mediterrânicas e especialidades da circundante região de La Mancha. Um buffet de pequeno-almoço é servido e também há um bar no local. Existem 5 salas para eventos para até 400 pessoas. Estão disponíveis check-in e check-out expressos. Uma variedade de lojas, restaurantes e bares está disponível a cerca de 5 minutos a pé da propriedade. 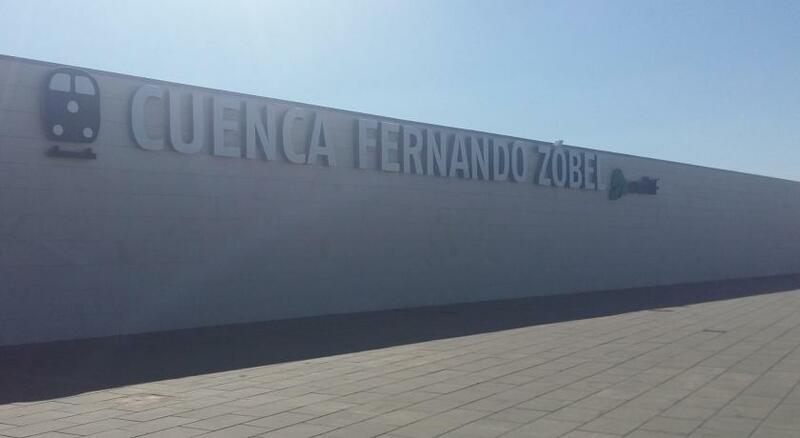 O estacionamento público gratuito é providenciado na área e autocarros para o centro histórico e para a Estação Ferroviária Fernando Zobel param mesmo em frente à propriedade. NH Ciudad de Cuenca dá as boas-vindas a hóspedes de Booking.com desde 25 de Mai de 2004. Em que período gostaria de hospedar-se em NH Ciudad de Cuenca? Este quarto climatizado apresenta pisos em madeira e janelas insonorizadas. Disponibiliza 2 camas individuais ou uma cama de casal e uma casa de banho privativa com produtos de higiene pessoal gratuitos. Também inclui uma secretária, um mini-bar e uma televisão de ecrã plano com canais por satélite. Oferece acesso Wi-Fi gratuito. Estacionamento público disponível no local (carece de reserva) Custos: EUR 9,90 por dia. Informação essencial NH Ciudad de Cuenca aceita pedidos especiais -adicione-o(s) no próximo passo! NH Ciudad de Cuenca aceita estes cartões e reserva-se o direito de reter um valor temporariamente no seu cartão antes da chegada. Qualquer tipo de cama extra ou berço está disponível mediante pedido e terá de ser confirmado pela gerência. - De 01 de Julho a 01 de Setembro: apenas jantar. Por favor, tenha em atenção que o hotel é totalmente para não fumadores. Um dos bairros mais pitorescos em Cuenca! "The room was comfortable and very clean. The safe was free to use and easy. The bed was comfortable with a choice of pillows. Free bottle of water and a mini bar. The bathroom had complimentary toiletries of a good quality. Breakfast was included and was very good indeed. Plenty of choice, hot and cold food. Great position in town to walk from. Great underground car park for a small fee. Would recommend for sightseeing. About half an hour walk to the Hanging Houses and old town. Fabulous." "Classic business hotel - comfortable & well-appointed. A bit further from town than I'd expected, but some really good restaurants just next door & a lovely bakery & coffee shop opposite. Lots of free on-street parking." Não recomendo jantar no hotel. Quarto muito espaçoso e confortável.